Home » Life on Mars? 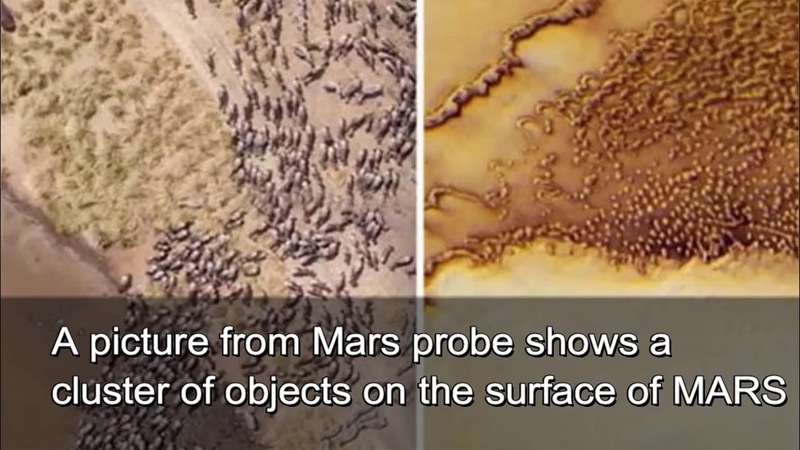 “Flock of animals” captured on the Red Planet !! The video seems to show a large group of objects on the surface of the planet, spanning miles. And another angle seems to reveal open parts of the area that are said to be feeding areas for animals. Speaking to the Daily Star Online exclusively, conspiracy theorist Neal Evans has stated that this is proof of life on the Red Planet – alongside an entire environment capable of supporting them. He said: “I believe this is a luxuriant and habitable ecosystem on Mars. “I studied the section of the map for hours and compared it to the visions of birds from the places on Earth, and it seems to be on the side of the north pole. Neal posted the original footage on his YouTube channel – called the Disclose Screen – where he received more than 3,300 hits. The surface of Mars: could these images prove that LIFE exists on the Red Planet? These images released by NASA show the surface of Mars. They were studied by researchers and real seekers looking for telltale signs that water flowed on the Red Planet, which would mean that alien life could flourish there. Four geological layers to be surveyed by the mission, and top reaches of Mount Sharp beyond the planned study area. And viewers were sent to a frenzy over what they saw. And Neal believes that this may just be the tip of the iceberg. He later revealed, “I’ve been studying Mars and its history for years – we only know what they let us know. “It’s hard to say if this could be a new life or a new prosperous life, my guess is that mapping this could be a new ecosystem as a primitive land, prehistoric life that naturally formed or kicked off who knows ? Earlier this week, the same channel revealed that an ancient civilization on Mars may have been destroyed by a nuclear war.